Gold bars have always been a go to product for investors looking to pay the lowest premium over spot when adding to their gold postion. Take advantage of industry low pricing on Name Brand 1 Oz Gold Bars from Monument Metals today. The brand will be our our choice and is random, we cannot accept requests for a specific type of bar for this product. Contains 1 troy ounce of .9999 Fine Gold. Minted by a brand name mint and shipped in original assay card packaging. 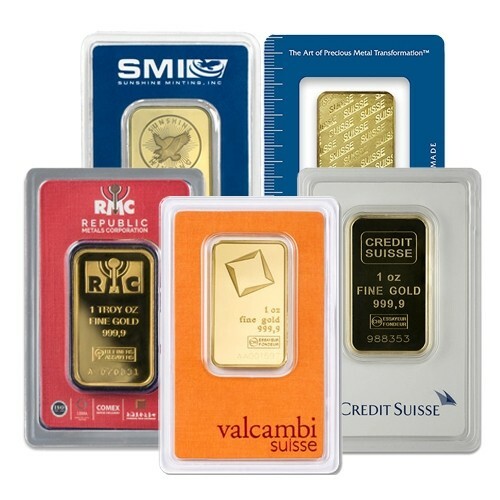 Best Prices on 1 Oz Gold Bar - Brand Name of Our Choice!